WORLD NEWS - The African President Jacob Zuma is scheduled to meet the Libyan ruler Moammar Gaddafi next week at Tripoli, as said by a statement on the South African President's website. President Zuma is going to meet the Libyan dictator "in his capacity as a member of the African Union high level panel for the resolution of the conflict in Libya" said the statement. The African panel to Libya consists of South Africa, Uganda and Mauritania. 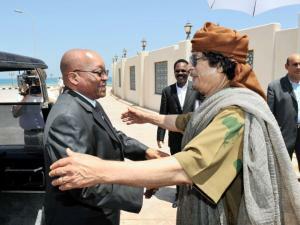 This is President Zuma's second visit to Libya. He was a part of the African delegation that visited Libya last month, to sort out its internal problems. The meeting included details like cease-fire talks, which has evidently failed to bring about any results. This visit of the African President is a part of the international effort to stop the war between the forces that still remain loyal to Gaddafi and the rebels who want to oust him from power. The NATO has formed a coalition, which has struck military targets in the nation as a part of the U.N mandate to protect the Libyan citizens. The airstrike comes after the U.N issued orders to protect the civilans from the loyalist forces of Gaddafi. The International Court of Justice has issued a warrant against Gaddafi for the numerous war crimes committed by him in the war-torn country. Earlier South African government harbored exiled former leaders Jean-Bertrand Aristide, of Haiti, and Marc Ravalomanana, of Madagascar, but in the present scenario giving shelter to Gaddafi would be backfired to the country. Even it’s a grim chance of giving any refuge to Gaddafi, as last week the country accused Libya of giving wrong information over the fate of South African photo journalist, now believed to be killed by loyal of Gaddafi. South African stance is somehow dubious and a bit diplomatic. In one hand it abhors the actions of Gaddafi forces to ruthlessly kill civilians and journalists, accusing Libya of dishonesty. And on the other, the country also criticized NATO’s exaggerate bombings. France, Britain and US are the leading forces in helping NATO forces, bombing on Libyan forces. The UN Security Council already authorized "all necessary measures" to protect civilians. The French foreign minister, Alain Juppé expressed his hope to achieve the objective to dethrone Gaddafi within months. Mr. Juppé said that the Libyan leader's departure was inevitable. "There are more and more centers of resistance [to Gaddafi], especially in the west," he said in the parliament session. The increasing air strikes on Tripoli reflect the western concern over Libya’s civil war. Though, military analysts predict it might not enough to bring the balance in the country. NATO’s move is heavily criticized in many sectors, as critics fear the NATO has overstepped its mandate. The United States reinforced the rebel force National Transitional Council as a possible party for the government. Although unlike France, Italy and Qatar, US still to make any diplomatic association with the rebels. There has been report published in French newspaper, saying Gaddafi is tired of civil war and NATO’s air strikes and possibly leave his position if allowed to stay in his country. It is also reported that people from Gaddafi’s own camp held secret meetings with envoy of western nations. In a recent attack by NATO, the Libyan leader lost his son and three grandchildren. However, 68 year-old Libyan leader has vowed to fight to death.